The official LinkedIn buttons are boring - all they do is link to your personal profile page on the LinkedIn website. 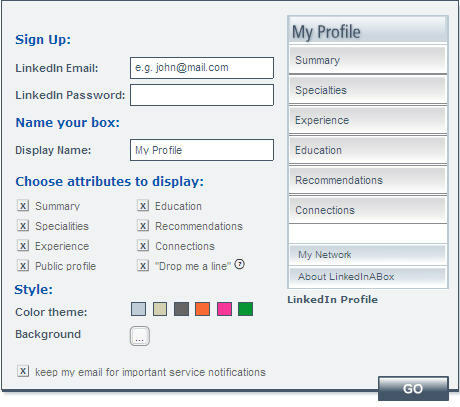 If you wish to display your LinkedIn profile on your blog or website, here's something much better - LinkInABox. The buttons are sleek, interactive and done in Macromedia Flash. The site visitors can read the summary of your personal LinkedIn profile without leave your website. And every part of the button is customizable including the background color. You can also decide what sections of your LinkedIn Profile should be displayed on the badge. Very cool.